Is chocolate Paleo? Well, I can answer that question for you. I have done a lot of research. You can find the answer below. I have references too. Most everyone seems to agree that, though chocolate is not Paleo, it is okay to eat a controlled amount from time to time. Many chocolates you would buy and eat from the store are processed cocoa beans with sugar, soy lecithin and sometimes milk added; which is not Paleo. After reading many different blog posts on the subject it seems most people agree that, though there are a few drawbacks to cocoa itself, raw cocoa can be considered Paleo. However, not everyone wants to eat the bitter seed produced by the cacao tree. What is chocolate made of and what type is best to eat? Chocolate is made from fermented cocoa beans of the cacao tree. The fermented cocoa is then processed and turned into solids (nibs) and cocoa butter. The solids are used to make dark or milk chocolate and the butter is mostly used for white chocolate. Cocoa nibs are rich and bitter making them hard to eat, which is where sugar comes in. Sugar and sometimes milk is added to enrich the taste of chocolate. These things are considered non-Paleo. Contrary to white and milk chocolates, dark chocolate has little sugar added and contains no milk. Dark chocolate can have a ratio of fifty to one hundred percent cocoa – the higher the ratio of cocoa the less sugar added. Though dark chocolate has sugar and a little soy lecithin (to emulsify the ingredients) it is the best to consume because of its benefits and it is closest to the original form of the seed. Cocoa nibs are also very good to eat or add into recipes for good flavor. Or make your own Paleo chocolate with organic cocoa! Chocolate is a good source of the minerals copper, magnesium, iron, and manganese. Dark chocolate is low in sugar and high in antioxidants. It is good for satiating that sweet tooth and has little sugar. It helps to repair free radical damage and contains flavanols. Chocolate is also considered to improve cardiovascular health, blood pressure and reduce the risk of heart attacks, blood clots, and strokes. What are the disadvantages of chocolate? Dark chocolate contains sugar and soy lecithin which are considered non-Paleo (even though it is in small amounts). It contains oxalates that prevent the absorption of calcium and can cause kidney stones if eaten in large amounts over a short period of time. Some chocolate could have come in contact with gluten grains when processed. Chocolate binds to minerals such as calcium, magnesium, and iron because it is high in phytic acid. For some people, it is hard to control themselves from eating too many sweets. Not really. Chocolate is not considered Paleo, but that doesn’t stop many people. Dark chocolate can still be a very healthy treat if eaten in moderation. It all depends on your preference and how strictly you want to follow the Paleo diet. Many Paleo advocates recommend if you are going to eat chocolate, to check the labels for any additives or milk and high sugar content. Try to eat dark chocolate with as little sugar as you can handle, preferably between a 70% to 100% ratio of chocolate. Rather than going through the hassle of finding good chocolate, make your own Paleo chocolate with organic cocoa. You can even use raw cocoa nibs in your foods or cocoa powder on fruits and desserts. So… there are the facts. What do you think? 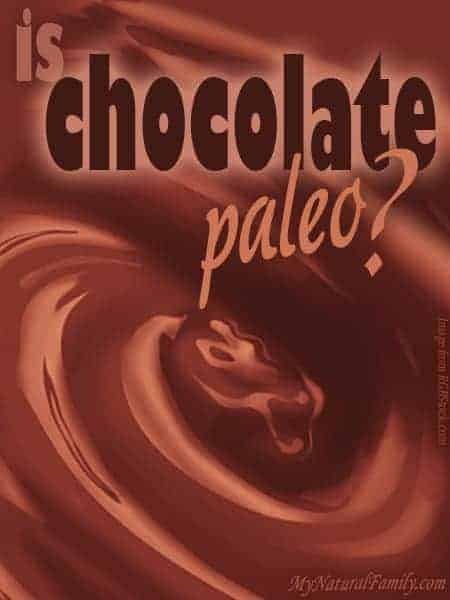 Do you think chocolate should be considered Paleo? Give us your input! 9 of the Best Paleo Chocolate Chip Cookie Recipes You’ll Ever Find!